I worked with an organisation this week to assist them to better understand the behaviours of enhancing team dynamics and collaboration. It is all very nice and well people understanding the principles of this, but reflecting and practicing behaviours takes it to another level. 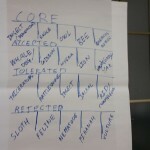 I used the Organizational Zoo metaphor throughout the workshop to safely look at and understand behaviours. The response was very positive and interesting ideas and reflections emerged from the group. We worked through individual behaviours and then behaviours in a group and then in a team. 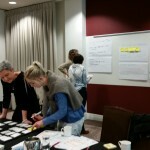 The outcome was the group themselves designed what they believed were required and ideal behaviours for the teams they worked in to be successful. So they owned it, not the external consultant. All of this was undertaken using the Organizational Zoo metaphor as a safe way of understanding ourselves and others. All of this is much better in my view than the cliched team building that is often trotted out as it takes things to a deeper level and the team owns the outcome. This entry was posted in metaphor, workshop and tagged team dynamics. Bookmark the permalink.